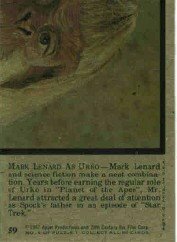 John Kenneth Muir's Reflections on Cult Movies and Classic TV: Trading Card Close-up # 5: "Mark Lenard as Urko"
My fifth trading card "close up" is # 59 in the Planet of the Apes TV series collection from 1974. There are sixty-six cards in this set, and this one serves as number six in puzzle # 1. Got that? Anyway, I picked this particular card, featuring series villain General Urko, not just because I love the gorilla's hat (! ), but because - as the legend reads - the great Mark Lenard essayed this role. 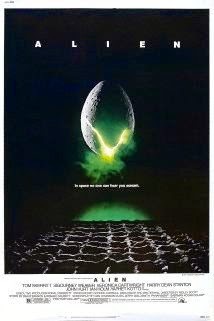 I've always felt that Lenard is a true shining star of sci-fi actors. He passed away in 1996, but Lenard is one of the few actors in history to have played (in a featured, not extra capacity...) a Vulcan, Romulan and Klingon on Star Trek. And that's just one achievement. In addition to his role as Sarek - Spock's father - on various Star Trek generations ("Journey to Babel," "Yesteryear," "The Search for Spock," "The Voyage Home," "The Undiscovered Country," "Sarek," and "Unification"), he made a (brilliant...) career of playing aliens or non-humans on other classic TV shows. 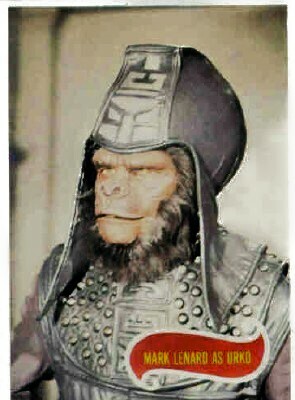 Planet of the Apes is probably his mos t memorable role, because he was so effective as the brutal simian General, yet Lenard also played an alien ambassador with a removable head (!) on Buck Rogers in the 25th Century ("Journey to Oasis"), the evil Emperor Thorval in the Cliffhangers (1979) segment "The Secret Empire" and a military overlord in an episode ("Zone Troopers Build Men") of Otherworld (1985). Lenard guested on shows as diverse as Mission: Impossible, The Magician and The Incredible Hulk, and even had a role in the Woody Allen film Annie Hall. Now that, my friends...is a great actor. Count me in for the Mark Lenard love fest. The man was a joy to watch in just about any role. He even managed to bring grace and dignity to his performance in “Journey to Oasis”. How many actors could have pulled that off, considering the inherent ridiculousness of the character? And, of course, Sarek is simply one of the best recurring guest characters in sci-fi history. On a related note, I’ve often thought that it’s a damn shame that Julian Glover isn’t held in higher regard as one of the great sci-fi guest stars. He had more-than-memorable roles in Doctor Who (“The Crusades” and “City of Death”), Space: 1999 (“Alpha Child”) and, of course, The Empire Strikes Back. It’s just a shame he never did Star Trek. If he had, I believe his geek icon status would have been assured. Yep. Mark Leonard played the role of Ambassador Duvoe on Buck Rogers (the guy who could remove his own head...) with such supreme authority and confidence that viewers could actually believe in that wacky notion. You mentioned his grace and dignity, and you're right on. The Lenard appearance that freaked me out was his turning up in the Hawaii 50 ep "To Hell With Babe Ruth" in a ninja outfit with throwing stars- in 1969. He's always been cool, but he was a ninja before ninjas were cool (before Frank Miller).